Add a little warm water and sugar to the yeast in a glass and leave it until it foams. Mix into the flour, add the mashed potato and slowly mix in the water. Add a large pinch of salt and knead for ten minutes. Leave to rise until doubled in size, knock back the dough and spoon into a nine hole fairy-cake tin. Leave to rise again for another fifteen minutes and bake at 220c for 15-20 minutes. Meanwhile, make the mini burgers by mixing together all the ingredients except the cheese. Divide into 9 balls and put a cube of cheese in the middle of each. Form the mince around the cheese and shape into burgers. Heat a griddle pan to high and cook the burgers for about 4-5 minutes on each side. 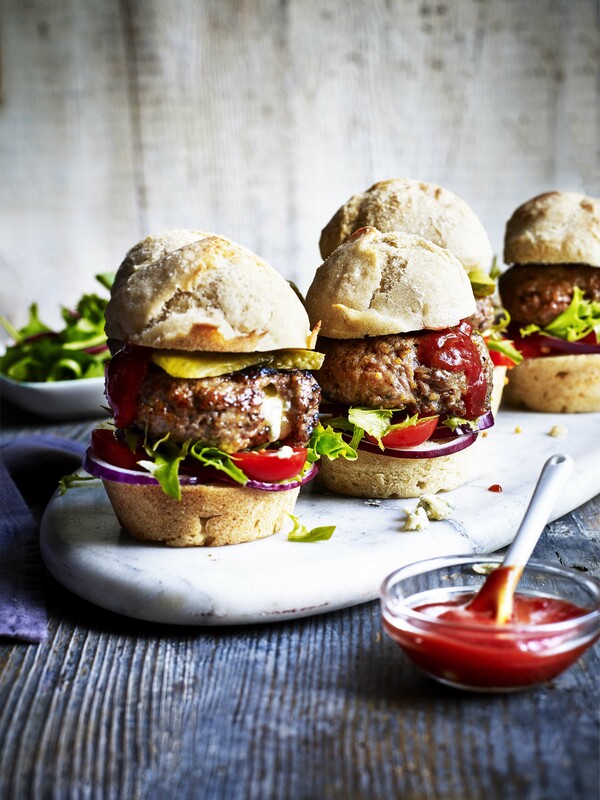 Slice the buns in half and serve each mini burger with sliced red onions, tomato and lettuce. A tasty weekend brunch recipe that the whole family can enjoy during a leisurely day. Ideal for using up leftover cooked potatoes. Sausages could also be added to this breakfast brunch. "This brightly coloured and intensely flavoured recipe is speedy enough for any night of the week. The sweet and sour relish sets off the salmon beautifully and I've roasted the King Edwards in their skins to give the whole thing wholesome comfort." The masala is a curry-lovers favourite! Swap the meat for this vegetarian delight, made with gorgeous potatoes and flavoursome chickpeas - delicious! Recipe courtesy of Olivier Limousin, l’Atelier de Joel Robuchon, created as part of an eight course potato tasting menu specially for Potato Week 2012.